Quirky Jessi: World's worst travel gear - Don't forget the baby! Or your caffeine hose. World's worst travel gear - Don't forget the baby! Or your caffeine hose. A while back (as in, um, back at the end of last year), Emily sent me this link and I just had to post it, but I didn't even know which ones I should show you guys. They're all so awesome! Well, awesomely horrible, that is. It's a list of the world's worst travel gear (I bet you couldn't figure that out from the title), and some of the stuff is just, well, awful. Be careful clicking because it does contain a few things you might not want little ones seeing (like the shenis...and stained undies, ew!). Common travel problem: You are taking a family road trip with your toddlers who are so quiet—and unimportant to you—that you keep leaving them in the car while you go off sightseeing. 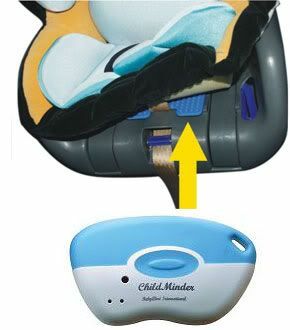 The obvious solution: The ChildMinder will sound an alarm on your keychain when you walk more than 15 feet (4.5 meters) from your vehicle while your little ones are still in their car seats, thus avoiding you reenacting some combination of Home Alone and a National Lampoon-worthy Vacation. Of course, for the alarm to be effective you’ll have to remember to bring your keys with you as you leave your car. But you wouldn’t forget something as important as your keys, would you? Gah! Now I know some people really do forget their kids in the car. I know sometimes stuff happens and even good people end up in embarrassing situations like this. But um, if you're going to go through the extra planning of actually buying something to make sure you don't forget your kid, isn't that a bit excessive? Or scary even that people might rely on this? And as for the "caffeine hose," that would be pantyhose, and they release caffeine directly into the wearer's skin, as does the soap shown in the same picture. You'll just have to see the rest of the list (and the wacky descriptions, hehe) yourself because yikes! Thanks again, Emily! As yours is a family friendly site I'll try to moderate my comments but they have to be taking the p with the Shenis! I have seen other items that do the same job but that aren't that shape or that length! hee hee!! I completely forgot that I sent that to you. Haha, thanks Fairy. With topics like that, it's kinda hard to keep it family friendly, huh?